Holds a 3" x 4" photo; 4"W x 5.5"T.
Handcrafted decorative glass cloche on marble base. 14-karat gold and enamel branch and butterflies at interior. Handset with Swarovski® crystals. Handcrafted decorative glass cloche on marble base. 14-karat gold and enamel branch and butterflies at interior. Handset with Swarovski® crystals. Hand-painted details. 11"Dia. x 15.5"T. Made in the USA. Handcrafted Dragonfly Trellis candle. 3.75"Dia. x 6.25"T. Trellis-textured porcelain. 14-karat gold detailing with antiqued touches. Hand-enameled, metal dragonfly detail. Hand-set Swarovski® crystals. 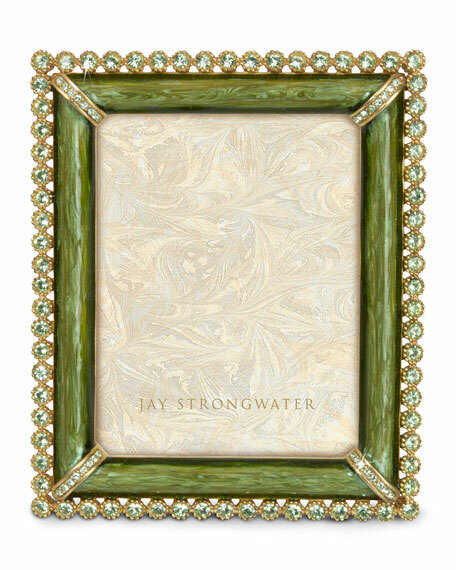 Exclusive Jay Strongwater fragrance features jasmine, tuberose, and golden tangerine notes layered with amber, clove, and a hint of bitter orange. Imported. Handcrafted frame from the Flora Fauna Collection. 14-karat gold pewter base. Glass and enamel trim. Swarovski® crystal detail. Overall, 5.5"W x 7.3"T. Holds 3" x 4" photo. Hand wash. Imported. Handcrafted compact mirror. Brass with a 14-karat gold finish. Hand-set with Swarovski® crystals. Two interior mirrors: one regular and one magnified. Push button closure. Approx. 2"Dia. Imported.